In the early twentieth century, Australia wanted to be identified as, “the white man’s country”. This pursuit involved many racist tactics and propaganda erasing those identified as “non-white” from the country’s narrative. 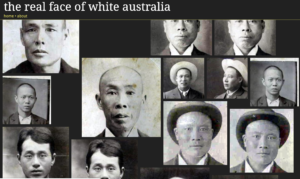 The Australian government incorporated large-scale oppressive policies on Non-European immigrants and Indigenous Australians that monitored their every move. The Invisible Australians project was created to give a voice to the many Australians that faced these discriminatory laws and policies that denied them the full liberties and rights of their white Australian counterparts. There are a few other things I noticed while perusing the site to learn more about these amazing people. First, the site consists of predominately male portraits. There are women and children also present in the gallery, but very few compared to the plethora of male faces. Second, there is no particular order of the portraits. Not sure what was the intent of having the images randomized. Furthermore, I’m very interested in understanding why Sherratt and Bagnall chose to only focus on documents approved by Collectors of Customs? The overview of this project speaks on the discriminatory policies placed on Indigenous Australians, not just non-European immigrants. Still, the only records used for this project are from ST84/1, a series of immigration-related travel approvals. Lastly, the site may not provide user-generated contributions, but the overview does provide fun instructions on different ways to navigate through the gallery of portraits. “Reverse the order simply by adding‘?order=reverse’ to the url. You can also browse file by file by adding ‘?order=file’ I attempted both instructions and could not tell the significance of modifying my url. The order still appeared random and in no particular order. Invisible Australians is a captivating project. Using the very documents that once restricted people of their liberties, is now the very tool to share their stories. It’s important to note that Sherratt states this project is, “ not an exhibit, it’s a finding aid.” The portraits are used to reel the user into wanting to learn more about these people. Each portrait is a small glimpse into the unnecessary monitoring many people had to endure under the Australian government’s authority. I love parts of this project. I think this is a critically important story to tell and I think pulling together these primary sources is a particularly effective way to do that. However, I really do not like their claim that they are a finding aid and not an exhibit. To me, this reads as a way to reduce their responsibility to the public in relation to these materials, the history, and the people. 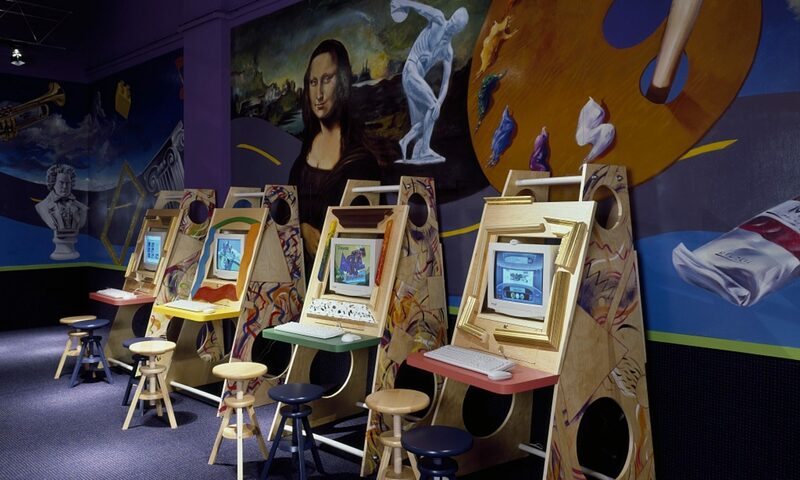 Maybe the project does not want to be an exhibit, but that does not mean the public will not interact with it as one, especially given the format of the website. I think with a history like this it is critically important that projects on it are not “half-assed” so to speak. Now I’m not saying this one is, but my concern is that by calling this project a finding aid and not an exhibit, the project leaders are letting themselves off the hook for interpreting the collection in a meaningful way and in a way that will actually help the public connect with and reconcile with this history (and its impact on the present). Second, I’m concerned it removes the necessity of collaborating with the modern-day descendants of the people in these records. I recognize that the project team cannot do everything and that they may be doing these things and more, but that I am unaware of them from my (brief) perusal of the website, but I still think these are valid questions to consider. What is the responsibility of any project to work with the impacted populations and how much is a responsible amount to curate and interpret? I do not think that calling yourself a finding aid rather than an exhibit removes this responsibility. Emily, totally agree. The intention is there but the site could definitely do more. One of my concerns with this project is agency and collaboration. Terms like, “giving a voice” and “liberating” are used, in my opinion, very loosely throughout this project. Considering there is no information about communities or modern-day descendants that were affected by these policies, how is this project “liberating”? Hi Sierra, great post! I think that the motivation behind this project is great and it provides us with an important look into the stories/lives of these individuals; however, I completely agree with Emily’s point about its creators calling it a “finding aid” and why that’s problematic. 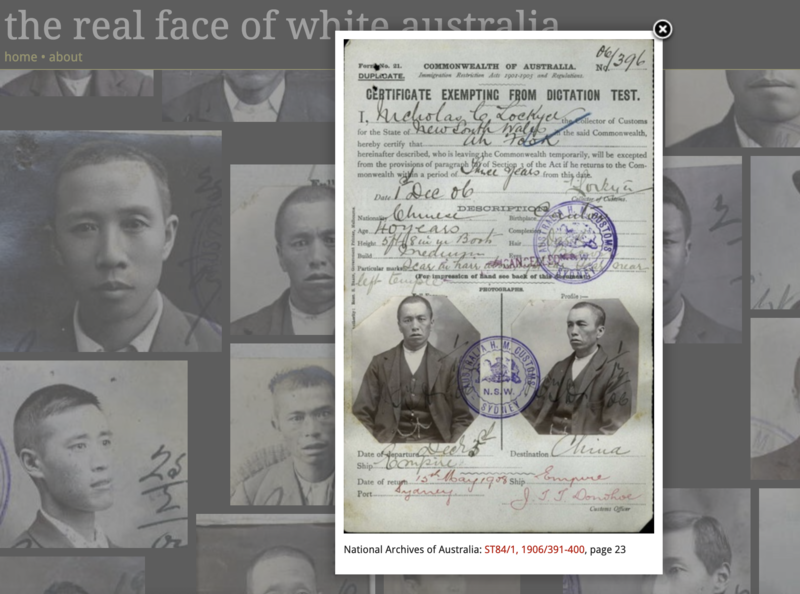 This project offers users a place to look at this collection of photos/primary documents- which is great, but there definitely should be a more in-depth interpretation of these records and the history they show us. I noticed in my own exploration of the website that they have a section for blog posts, but there hasn’t been any new ones since 2013. Bagnall answered the concern about the lack of female portraits in one of these posts. This is fine, and I was glad to see that she took the time to do this- but it’s also an example of how better interpretations can play a vital role throughout the website (and not just in a short post). Emily also brought up how there are other important opportunities here for collaborating with these communities and the decedents of these individuals (which I also completely agree with and would love to see!). I’ve been thinking a lot about this project ever since you taught us about it in class, Sierra. I think Emily and Melyssa made great points in their comments, and we had a good discussion in class, too. I’m kind of stuck on the idea that all of these artifacts exist because of over-surveillance. I think the intent was good but not enough. Even some of the lines in the description, “They faced discriminatory laws and policies designed to deny them their place as Australians,” isn’t really groundbreaking. And it manages not to say WHO was being racist and creating the discriminatory laws and policies. This is so much a part of a wider conversation about racism and white supremacy that I think to do this project without that conversation and to just say “here they are” and “look what we did with digital tools” is… disappointing? I respect what the project does, and it is powerful to see the faces, but I do wish that there was more of a “So What?” moment, which relates back to the “finding aid” versus “exhibition” debate.